I love this device. When I read your post here then I know which one of the best ebook reader should I buy. I have seen my friend’s Kindle..It’s so awesome. I’m about to buy a book reader and was thinking of the Sony PRS600B. However my question is this. I’ve read that Waterstones have a dreadful selection of books and rather expensive too. Living in Europe, are we limited to where we can purchase our books from? I thought that it was fairly open provided the ereader could recieve the format required?!? Please help as this will largely dictate which reader i buy. 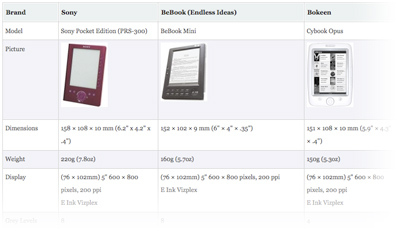 I am wondering if you do reviews for those who self publish and are working to get their books on these e-readers? I’d be interested in learning more about publishing on these other readers. I would like to see a reader that could display 2 pages at a time as is normal when reading a book. 2 seperate screens would be nice, one for the LH page and the other for the RH page. A second possibility is for a device with a 10 inch screen to display the 2 pages side by side and turning the page in either direction would display the appropriate odd or even numbered page. Is there any possibility that a device like this would appear on the market. There can’t be any technical reason for not doing things in this way. I want to buy a reader to go trekking. I’ll be using it in a tent with only a headtorch for light. What i want to know is, will the light from the headtorch reflect in the screen of the reader? Anybody know the answer? I am very, very nearly ready to make a purchase of a 6″ Beebook Reader as a surprise birthday present for my partner. The reason for the purchase is that now we are getting on a bit in years Ally is becoming restricted in his selection of reading material as this is determined by the size of print. An ebook reader would be a dream! What I need to know before I take the plunge is firstly, what percentage of reading material is available in ebook form for the Beebook reader. Secondly, where and how do I buy the ebooks, and finally what ‘extras’ am I required to buy along with the reader, e.g. batteries, battery chargers etc., or do they come as a package? As a long standing ebook reader convert since 1998. I would like to say you can buy your books for anywhere. The Kindle is more tying as you need to buy from Amazon however, I do believe they have conversion software if the book allows. Also you can purchase in your favorite formats. Epub looks great on the Sonys… You are definately not restricted also you can buy from 3rd party book stores or directly from publishers. I have last count over 10K ebooks.. and continually adding more to my collection. Amazon’s Kindle wireless reader had a huge hurtle to overcome in order to become more than just a gimmicky gadget that would be forgotten in a couple months after its glitzy launch. There’s something about going to the store, purchasing a hardcopy book, and rifling through the pages that e-books have never been able to compete with. Most of the backlash stems from the fact that the platforms on which those books have been displayed historically haven’t been up to the task. The screens are too small, too bright, look too much like computers, and make you feel as if you’re still jacked into the high-tech matrix that traps us all every day of our working life. Essentially, people buy books to get away from computers. What’s more, “book people” love books. I am looking for a reader not so much for books as to read pdf and word documents. In addition to size and weight concerns (big screen important, and willing to have it be a touch heavier if necessary), I need mark-up ability (e.g. a stylus to make notes and/or something like apple’s “stickies”). Advice appreciated. Thanks. Can anyone suggest an e-reader for somene with advanced macular degeneration – i.e. one that has really high definition and reasonable sized lettering? I am trying to find en ebook reader or similar that can turn the pages through voice activation. through a fall my mohter is rendered paralysed but prefectly able to read but can’t turn the pages. Martin, there is a 10.2 inch device available from iRex, the company behind the Illiad, but it’s about 650 British and has a touchscreen, which largely compromises the benefits of epaper displays. If any devices are released boasting the two screens, it’ll be one epaper and one TFT I reckon, that’d be far more useful. Or, they could just put a solar panel on one side, to save ever having to explicitly charge the reader, then with a splash of your old wireless, data transference type of magic, you could seal the device and make it waterproof – so men could read books in the bath. Don’t ever buy a Cool-er ereader…. my husband bought me one for my christmas and it worked fine for 3 weeks, then the screen became frozen. After trying to contact Cool-er for 2 months i was finally answered and told to send it to an address to get it fixed. I sent it and didnt hear a peep for months and no emails replyed to… i am still waiting to this day and christmas is coming round again! I have since then learnt that the Cool-er company has gone bust and they havent even had the decency to send me my e-reader back! If you buy an amazon kindle can you ONLY buy books from amazon? PRS-505 lasted just 20 months before the screen gave up. Sony are not interested in repairing it under warranty, they want almost the full cost of a new one to repair it. The device ‘may’ be good but the after sales service (if it goes wrong) stinks. I am 80 years old and would like a reader that can very the type size . Does any e-reader display coloured images? omq which one should i buy?????????? My husband really only likes cowboy books, ie Westerns. Is there a good selection of these on any eBook reader, please? I would also like to know if there is a way to get around the international restrictions of the Nook Color. Thinking of buying from US and using in UK. No one seems to know the answer to this! I wouldn’t suggest buying a Nook to use in the UK, as you’ll have to buy all your ebooks in $ if you want to use the B&N store. I’m almost there on buying a Sony PRS 350 but 1 thing is holding me back. I have quite a lot of ebooks on my pc but hate sitting at the desc reading them. They are in PDF, ePUB etc… formats. I know the Sony can read them but no one seems to know if I can simply connect the reader to the pc and import the books. Will I be able to do this or do I have to start buying ebooks again? REALLY hope someone can help me, I’ve almost finished my current read so the reader may be my next purchase. I’ve got a PRS 300 ….I use calibre to get the books from my computer to the bookreader. Calibre is a free program and is awesome ! I want an ebook reader that plays music etc aswell as books that can be downloaded from any website. Looking to find an ‘e’ book with voice activation, needed for a sufferer of severe M.S. who is unable to use her hands but has a brilliant mind (and a wicked tongue)! Can anybody help? The kindle Touch has the facility to shift between reading and listening to the text being read do you know if any other e-book has this facility.